If you're a fan of Phoenix history of the 1960s, you know about the sculpture that artist Paul Coze did of the Phoenix Bird for the Town and Country Shopping Center, at 20th Street and Camelback Road. You may even remember seeing it. And it may surprise you to find that you can still see it, it just takes a little bit of work. Come along with me. As of this writing, March 2018, it's there, on public display, in what I call "hidden in plain sight". If you're a better driver than I am (and that wouldn't take much!) and keep your eyes on the road, you may have gone past it many times and never seen it. It's now on 21st Street and Camelback Road. Yes, it's there, and if you've never seen it there, really I can't blame you. I "rediscovered it" about three years ago when I asked the Woman in My Life to help me look for it. At the time she was working right across the street, and had never seen it. I was convinced that it was there, so one day we went to look for it. Sure enough, there it is! 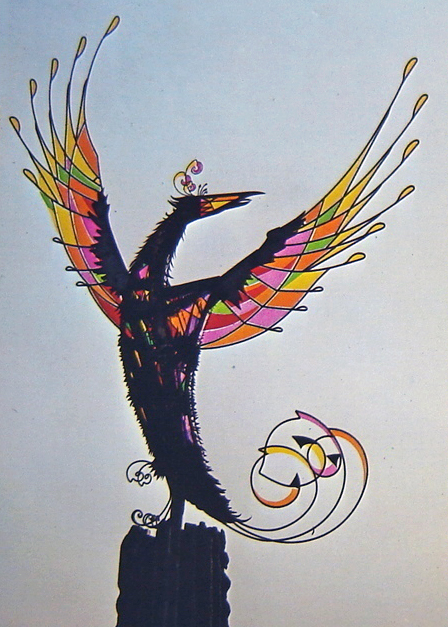 The Paul Coze Phoenix Bird sculpture at Town and Country. 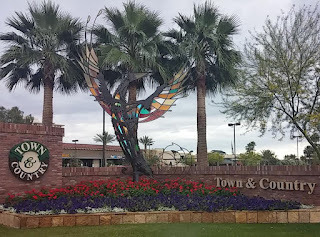 Located on Camelback Road and 21st Street in 2015. Difficult to see, but it's there. No, it's not a conspiracy man. It's simply an unfortunate placement, a design that meant well. I'm a designer myself and I know that all too often designs fail. Luckily for me, I design on a computer where I can scrap it all and try again, but the design at 21st Street and Camelback is set in brick. I'm sure it looked good "on the drawing boards" but in practice the sculpture is nearly invisible from just about any angle. It's not easy to see from the street, so I advise entering Town and Country at 21st Street, stashing your car, and getting out to see it. Look out for cars! I'm thrilled that the nice people at Town and Country choose to keep, restore, and display this important piece of Phoenix history. And I love to be able to say, "yes, it's still there."